At the 2012 Auto Expo held in Delhi, Audi showcased a number of products including the recently launched Audi Q3, Audi Q7 V12, Audi R8 Spyder, Audi A3 e-tron etc. If you remember there was another car at the booth that was equally tempting, we are talking about Audi S6, a sports car based on the Audi A6 sedan. This is similar to the recently launched Audi S4 which is a more powerful version of the A4 entry sedan. The Audi S6 has been launched in India! In comparison, the BMW M5 is priced at Rs. 99.90 Lakh (ex-showroom, Delhi) and the upcoming Mercedes-Benz E63 AMG is expected to cost about this range too. Things are hotting up this month! 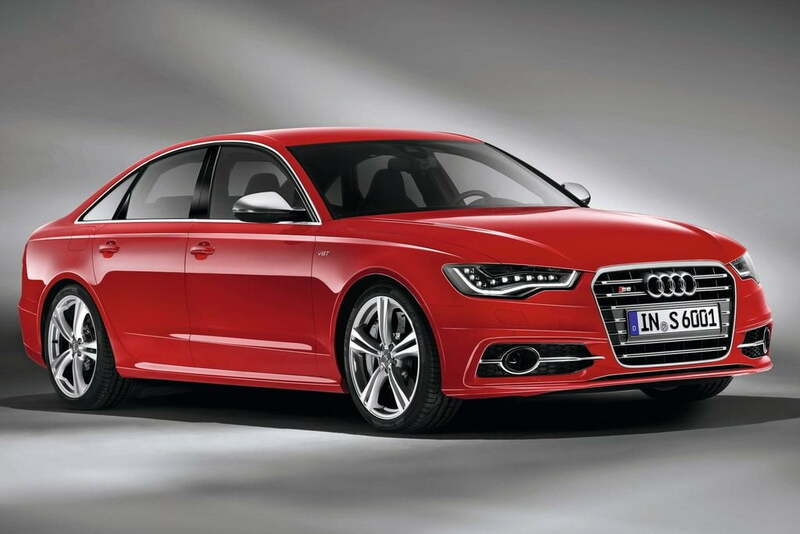 Audi is all set to launch the new Audi S6 performance sedan on 12th July 2013. This is the official teaser image revealed by the company on their Facebook page. The news is that Audi is gearing up for the launch of the S6 and will most likely roll out the car during the festive season of Diwali. Although we have talked in detail about the S6 in our exclusive post, we are going to tell you about the same once again. First up is the looks of car which is not something to die for as it an A6 from the hood to the boot. There is nothing striking about the car except for the specific bodily changes made in order to distinguish it from the A6. These exterior features include single frame grille, horizontal slats, chrome strip on bumper aluminium housing for ORVMs, new side sills, rear spoiler, elliptical chrome tipped exhaust and most importantly S6 badges. Dimension wise the S6 is 16 mm longer than the A6. Features on the inside include S6 badges on the key, Leather sport steering wheel with colored stitching and aluminum shift paddles, Illuminated door sill trims and both displays (MMI and driver information system) greet the driver with the S6 logo, A red ring over the start-stop button, Aluminum inserts on the selector lever, Aluminium finish on the footrest, the pedals and the soft keys of the MMI operating system, Three optional colors- black, lunar silver and Goa beige for headlining, instrument panel, carpet and seats, Height-adjustable sport seats with power lumbar supports and embossed S logos, Optional: Power-adjustable comfort seats with memory function and Power-adjustable S sport seats with integrated head restraints, Xenon plus headlights with an all-weather light, LED rear light. An electromechanical parking brake , Driver information system with color display , MMI radio plus including a Bluetooth interface, Audi sound system with ten speakers, Optional: LED headlights, adaptive light, the ambient lighting package, convenience key, head-up display, the parking system plus with 360° camera, power rear hatch, optionally with sensor control, and climate-controlled deluxe seats with massage function, Audi pre sense safety system, Adaptive cruise control with stop & go function, Audi side assist, Active lane assist, Speed limit display and the night vision assistant with highlighting of detected pedestrians, Top end MMI infotainment system features a large hard drive, an eight-inch monitor and the groundbreaking MMI touch input system. Obviously it will priced high and a major part of its pricing will be influenced by the high tech engine fitted under the hood. It features a 4.0 litre TFSI twin-turbo V8 engine that delivers 420 BHP of max power and 550 Nm of max torque @ 1400 – 5300 RPM. The car can sprint from 0 to 100 km/h in just 4.8 seconds and has an electronically controlled top speed of 250 km/h. The pricing is not confirmed at all but expect it to cost more than 60 or 70 lakhs. Stay tuned for more updates. Also check out- Exclusive pictures of the Audi S6.